I got this product for free when I shop online... innisfree pore foam cleanser .Its really nice ...I have no words to say because it's really very good.it's very refreshing ,it had a cooling effect and it hydrates my skin very well ...And this product is made of very good quality cotton and yes the serum on it really absorbed on my skin very well and yes the smell of this product is nice too it had a natural smell...And yes it also moisturise my skin very well...In love with this product and sure I will repurchase it again. 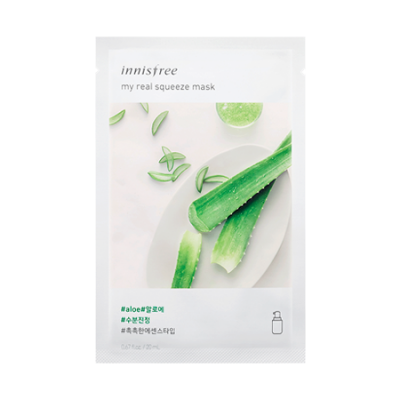 What makes this sheet mask one of the best out there is its amazing soothing and calming nature. It has a nice pleasant scent, nothing too overpowering and is soaked in clear essence. Because it gets absorbed really easily, it doesn't leave any greasy or sticky residue on your skin. I have loved it from the time when it soothed my sunburnt face where even water would sting. Definitely a must have in your emergency mask stash. The packet contains one sheet fully soaked in serum. The materials is made of very high-quality cotton and is very soft and gentle on the skin. Smells so refreshing but not overwhelming, and gives a nice relaxing feeling while it's on. The serum is very light and thin consistency, I keep it on for 25 minutes till the maximum serum is absorbed. I always store the mask in the fridge before use. It provides an extra cooling and refreshing effect and helps to wake you morning skin up. This mask makes my skin radiant and clear, it provides amazing soothing effect and hydration.